The Giant stone heads on eater Island are images that we’ve all grown up seeing and hearing about, many of us dream of visiting them and looking for ourselves, it now seems that if we get to make the journey we’ll see more than our ancestors ever did. The reason people think they are [only] heads is there are about 150 statues buried up to the shoulders on the slope of a volcano, and these are the most famous, most beautiful and most photographed of all the Easter Island statues. The hundreds of finely carved statues found across Easter Island bore mute witness to the collapse of Polynesia’s most advanced megalithic culture. Easter Island is one of the most remote inhabited islands in the world. The nearest inhabited land (around 50 residents in 2013) is Pitcairn Island 1,289 miles away; the nearest town with a population over 500 is Rikitea, on the island of Mangareva, 1,619 miles away; the nearest continental point lies just in central Chile, 2,182 miles away. The large stone statues, or moai, for which Easter Island is famous, were carved during the period A.D. 1100–1680 (rectified radio-carbon dates). A total of 887 monolithic stone statues have been inventoried on the island and in museum collections. Although often identified as “Easter Island heads,” the statues have torsos, most of them ending at the top of the thighs, although a small number are complete figures that kneel on bent knees with their hands over their stomachs.Some upright moai have become buried up to their necks by shifting soils. Almost all (95%) moai were carved from compressed, easily worked solidified volcanic ash or tuff found at a single site on the side of the extinct volcano Rano Raraku. The native islanders who carved them used only stone hand chisels, mainly basalt toki, which lie in place all over the quarry. The stone chisels were sharpened by chipping off a new edge when dulled. While sculpting was going on, the volcanic stone was splashed with water to soften it. 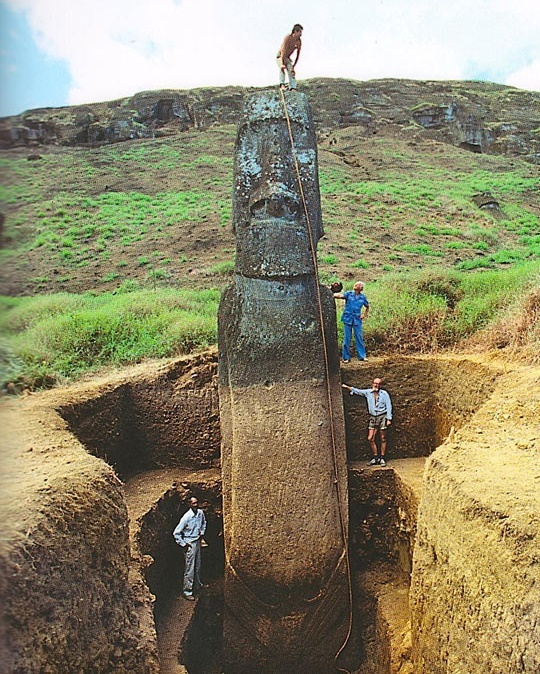 While many teams worked on different statues at the same time, a single moai took a team of five or six men approximately a year to complete. Each statue represented the deceased head of a lineage. Only a quarter of the statues were installed. Nearly half remained in the quarry at Rano Raraku, and the rest sat elsewhere, presumably on their way to intended locations. The largest moai raised on a platform is known as “Paro.” It weighs 82 tons and is 32.15 ft long. Several other statues of similar weight were transported to ahu on the north and south coasts. Possible means by which the statues were moved include employment of a miro manga erua, a Y-shaped sled with cross pieces, pulled with ropes made from the tough bark of the hau tree and tied around the statue’s neck. Anywhere from 180 to 250 men were required for pulling, depending on the size of the moai. Some 50 of the statues were re-erected in modern times. One of the first was on Ahu Ature Huke in Anakena beach in 1956. It was raised using traditional methods during a Heyerdahl expedition. 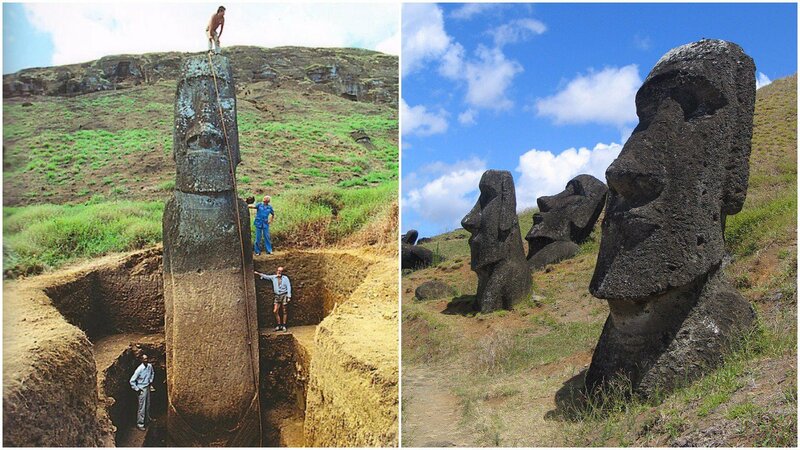 The heads of the moai in the quarry are sloped forward whereas the ones moved to final locations are not. This would serve to provide a better center of gravity for transport. The statues found along the transport roads have wider bases than statues installed on ahu; this would facilitate more stable transport. Studies have shown fractures along the bases of the statues in transport; these could have arisen from rocking the statue back and forth and placing great pressures on the edges. 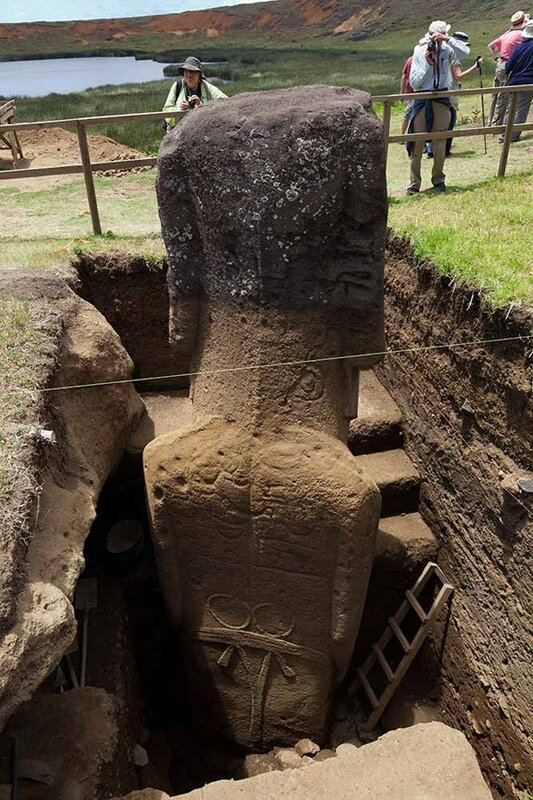 The statues found mounted on ahu do not have wide bases and stone chips found at the sites suggest they were further modified on placement. The abandoned and fallen statues near the old roads are found (more often than would be expected from chance) face down on ascending grades and on their backs when headed uphill. Some were documented standing upright along the old roads, e.g., by a party from Captain Cook’s voyage that rested in the shade of a standing statue. This would be consistent with upright transport. There is debate around the moai regarding the effects of the monument creation process on the environment. Some believe that the process of creating the moai caused widespread deforestation and ultimately a civil war over scarce resources. 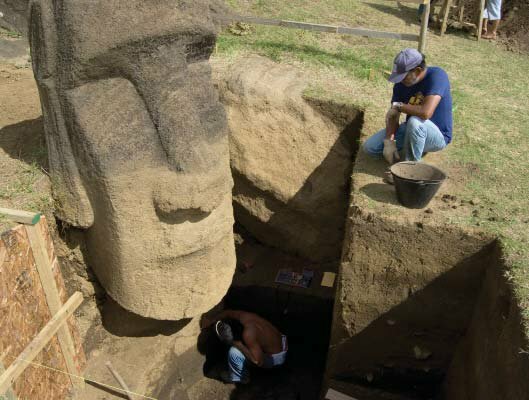 In 2011, a large moai statue was excavated from the ground. The statues reveal their creators to be master craftsmen and engineers and are distinctive among other stone sculptures found in Polynesian cultures. There has been much speculation about the exact purpose of the statues, the role they played in the ancient civilization of Easter Island and the way they may have been constructed and transported. If you have a good story to tell or write a blog then let us know about it on our FB page. We’re also happy to receive article or review submissions and we’d love to hear from you. Outdoor Revival – Reconnecting us all with the Outdoors.